Fortunately, it’s not that hard to get great feeds and speeds with the right approach, and this guide will teach you how. Bonus: You can go through this course right here at your own pace. But if you prefer, you can get it as a series of emails sent once a week on Fridays. Easier to digest and includes some bonus material not found here. Get Started, It’s Free! How Do Machinists Calculate Feeds and Speeds? By now you’re getting the idea that feeds and speeds are important, and that they involve a lot of different concepts. 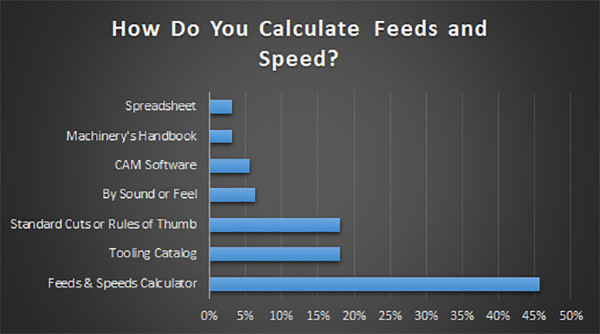 So it’s worth asking, “How do machinists determine Feeds and Speeds?” We surveyed our readership and here’s what they said: There are a number of approaches: – You can build or borrow a spreadsheet. This is the least popular for reasons I’ll discuss. Basically, it’s a lot of work for a lot of limitations. – About the same number use Machiner’s Handbook. It’s pretty antiquated, especially for CNC applications. – Amazingly few use their CAM software, even though most CAM has provision for it. The reason is simple, and we uncovered in our CAM Software surveys. Most CAM software does a truly lousy job with feeds and speeds. It’s pretty easy for you to do better. – You can rely on sound or feel. This requires quite a lot of experience and even though it has its devotees, it basically doesn’t work. If it did, you could buy “ear training” CD’s for machinists and Boeing would require you to pass a feeds and speeds by ear audio test before they would hire you. None of that happens because you can only hear really bad feeds and speeds. You can’t hear somewhat bad and you sure can’t tell the difference between ok and really awesome feeds and speeds. – You can rely on standard cuts that’ve worked in the past or rules of thumb. This method is pretty popular, but it sure is limiting. After all, are all of the pockets you cut the same depth? There are variances in every job and if you’re locked into just a few standard cuts, you’re missing out on the possibilities. BTW, one of the reasons CAM does such a lousy job is it takes the approach of databasing standard cuts. Every job is different. 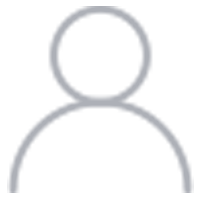 – You can rely on data from the Tooling Catalog feeds and speeds chart. That data is important, but used by itself, it’s also loaded with limitations. For example, a feeds and speeds chart is a 2 dimensional table. It can only cover 2 variables. 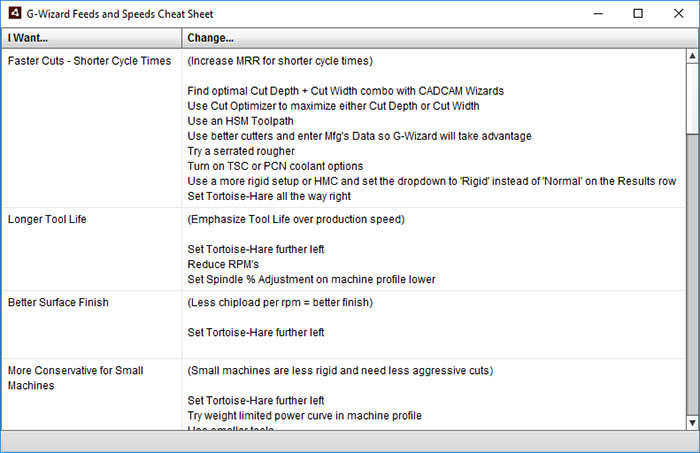 Our G-Wizard Feeds and Speeds Calculator covers 60 variables! When was the last time you looked through 30 charts to figure feeds and speeds? You basically can’t do it, which is why: – By far the most popular option is to use a Feeds & Speeds Calculator such as our G-Wizard. 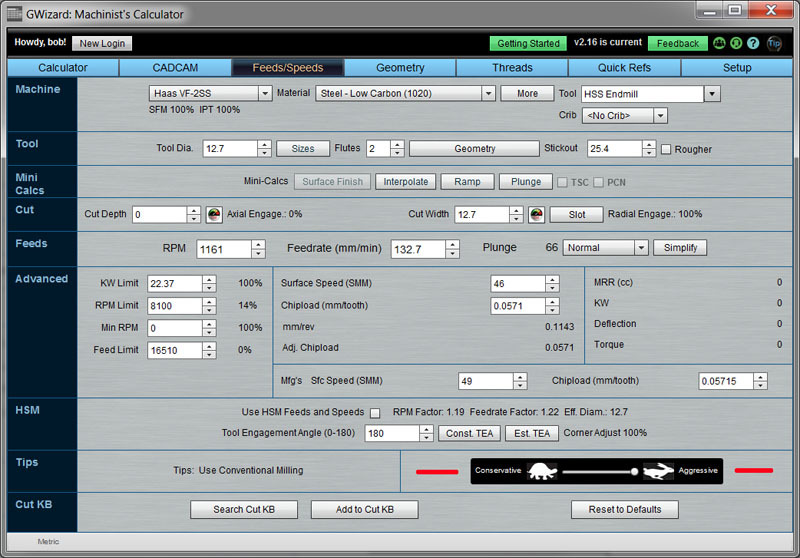 If you’re ready to accept a Feeds and Speeds Calculator and want to move on and learn other things, click here. If you want to know more about other options, keep reading. Can I do those “Basic Formula” calculations, perhaps in a spreadsheet? Seems easy, so where is the problem? Well, there are a lot of obscure physics involved in cutting. For example, there’s something called “radial chip thinning”. 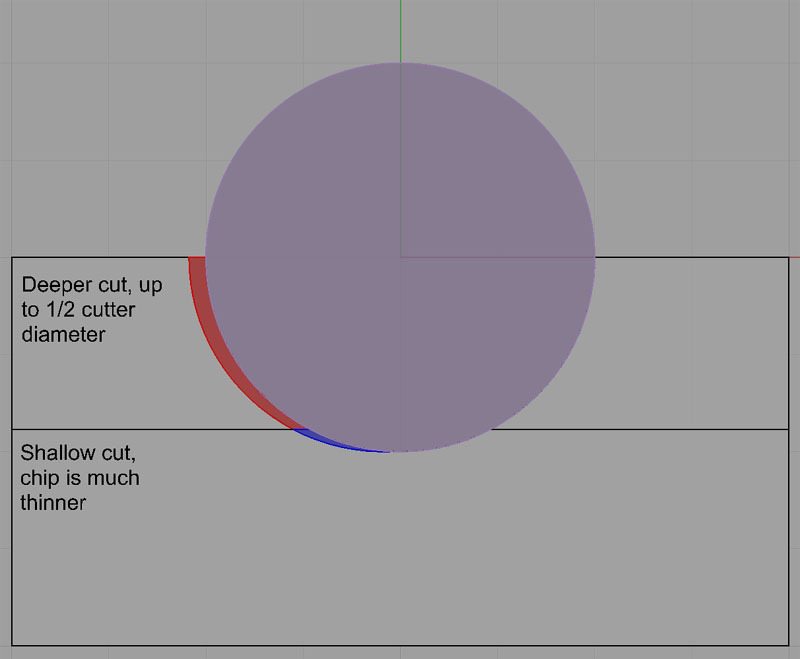 I’ll explain it below, but those formulas on Wikipedia don’t account for chip thinning, so anytime you’re cutting less than half the diameter of the cutter as your stepover or cut width, they’re wrong. The thinner the cut, the more they’re wrong, and ultimately they will be very wrong. By wrong I mean that if you use those Feeds and Speeds they’re going to wear out your cutter prematurely. So, you’ll need to go research the formulas for chip thinning so you can add them too. You’ll also want to find a large table of materials, with chip loads and surface speeds. Ideally your table is large enough to be a materials database that considers not just broad classes of materials, but individual alloys as well as the condition of the alloy, and adjusts the figures accordingly. You will want to scale back your figures if you are slotting. In fact, you want to adjust based on how wide the cut is as well as how deep. There are manufacturer’s tables out there to help you do that, it’s just one more step to add to your process. Speaking of steps, this stuff all adds up, and eventually, you have an awful lot of steps to be punching numbers into a calculator while rabidly flipping back and forth to look at various charts. I recommend using an Excel spreadsheet. In fact, that’s how my G-Wizard feeds and speeds software started out, but I’ll warn you, you will outgrow Excel if you keep adding bells and whistles like I did. Just so you know, G-Wizard Calculator considers almost 60 different variables. But it gets worse. Calculating any individual formula isn’t bad. Even calculating 60 isn’t the end of the world. But dealing with all their interactions, and especially backsolving is hard to impossible in a spreadsheet. Hey, I wrote one of the most popular spreadsheets back in the day called “Quattro Pro.” I do know a thing or two about spreadsheets. Keep reading and I’ll tell you why spreadsheets don’t work and why I wound up writing G-Wizard Calculator instead. What About Feeds and Speeds Calculators? What’s the Role of Manufacturer’s Recommendations? We call this feature the “Gas Pedal”, and it is depicted by a tortoise and a hare, much like the old Bridgeport manual mills had for speed control. I’ll talk more about how to use the Gas Pedal and how to think about how aggressive you want to be in the article “Toolroom vs Manufacturing Feeds and Speeds“, which is the next article after this one. You’re a beginner or someone who doesn’t care about getting the nth degree of performance from cutters. In that case, you should ignore Manufacturer’s Data. G-Wizard’s defaults are conservative and will do the right thing. Most users get faster cycle times and longer tool life from the defaults, anyway. You want every increment of performance you can get your hands on. You should be using the manufacturer’s data. But, the way to think about it is that the data calibrates G-Wizard to work it’s magic at an even higher level. 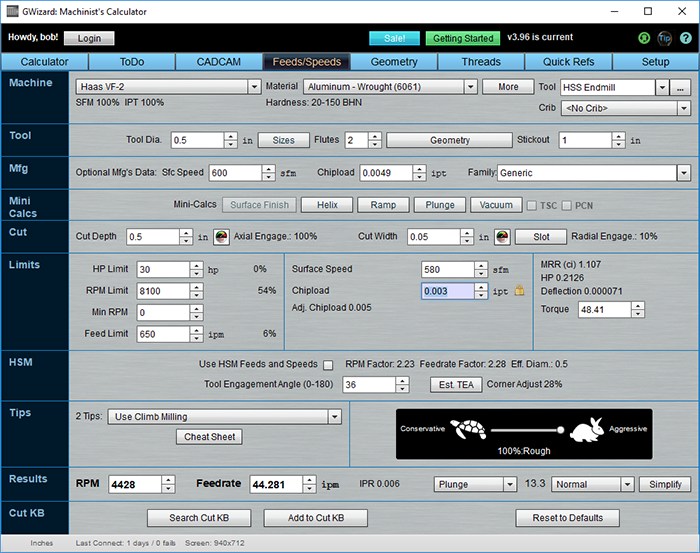 If you’re in that latter camp and use a particular line of tooling as most shops do, you’ll want your calculator to be able to import and use the manufacturer’s data. Ideally it will import and use it along with all the other rules and formulas built in. That last point is important: you need to apply all that math even if you have the manufacturer’s data Why? Because manufacturer’s data has to be simplified in the interests of presentation. Remember, a two dimensional table considers just 2 variables, perhaps material and tool diameter, for example, to look up surface speed and chip load. If you’re lucky, they give you a couple of extra tables and maybe some rules of thumb: – “These numbers are good to 1/2 diameter cut depth.” – “Reduce SFM 50% for full slotting or when cutting more than 2 x diameter deep.” You’ve surely seen such rules. Once again, a calculator can consider far more complex models. 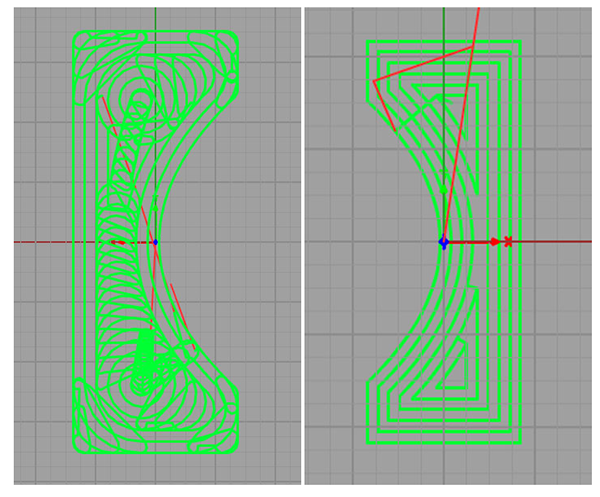 It can interpolate smoothly from 0 to the 2x diameter depth, adjusting all along the way. It can consider any cut width when figuring radial chip thinning instead of just the few in the manufacturer’s tables. This is valuable and leads to more performance no matter what you’re trying to optimize for. The Manufacturer’s data augments the 49 variables and 14 databases inside G-Wizard, it doesn’t replace them. Also, manufacturers are fond of giving big ranges for surface speed and chipload and then telling you very little about how to select the best point within the range. That’s what G-Wizard is good at. So, enter your manufacturer’s data into your calculator so it can add value to that data. G-Wizard lets you import the data as spreadsheet (CSV) files, to make it easy. It also includes a large catalog of downloadable manufacturer’s data so you may not have to do any data entry at all. Lastly, if your calculator has tool table (tool crib) support and the ability to import manufacturer’s data, they make ideal tools for comparing the performance of different tooling. Which Feeds and Speeds Calculator? Click through each of those to see features tailored by machine type. There’s some lingo associated with Feeds and Speeds, but it’s not hard to learn. 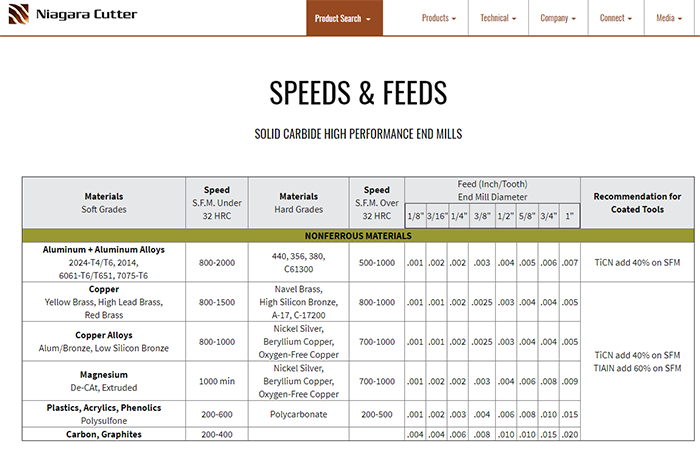 The “Speeds” portion of the Feeds and Speeds combo refers to your spindle rpm. Determining the correct Speeds for a job is largely a question of determining how fast the tool can be spun without overheating it in the material you’re cutting. Once a tool overheats, it softens (well short of melting), and this causes the sharp edge to dull. It doesn’t have to get very dull before the tool is done. If you keep going with a dull edge, you’re likely to break the tool, but you’ll see a very deteriorated surface finish before that happens. In a series of experiments performed early on in machining, it was determined that your spindle speed is the biggest determiner of your tool’s life. Running too fast generates excess heat (there are others ways to generate heat too), which softens the tool and ultimately allows the edge to dull. We’ll talk more in our series about how to maximize tool life, but for now, consider your spindle speed to be largely about maximizing tool life. “Feeds” refers to the feed rate, in some linear unit per minute (inches per minute or mm per minute depending on whether you’re using the Metric or Imperial system). Feed rate is all about the tradeoff between maximizing your material removal rate and being able to extract chips from the cut. Material removal rate is how fast in cubic units your mill is making chips–the faster the better for most machinists, right up until it creates problems. The most common problem is tool breakage or chipping when you feed too quickly. When that happens, the chips jam up in the flutes and pretty soon the cutter breaks. I’m a Beginner, How About if I Just Run the Machine Super Slow? It’s a common mis-conception that you can “baby” the cut in order to be ultra conservative. Just run the spindle speed super slow and the feed rate slow too and you won’t break anything, right? Well, not exactly. Here’s some examples of what can happen if you run too slowly: – If you reduce your spindle speed too much relative to the feed rate, you’re forcing the flutes of your cutter to take of too much material. The endmill is being pushed too fast into the cut and the chips get too big. You can easily break a cutter this way. – If you reduce your feed rate too much relative to spindle speed, you will soon cause your cutter flutes to start “rubbing” or “burnishing” the workpiece instead of shearing or cutting chips. Many machinists will tell you the fastest way to dull a cutter is just to run it with the spindle reversed and make a pass, but having too slow a feed rate creates a similar effect. We’ll talk more about how this happens in the Feeds and Speeds article, but suffice it to say that running too slow is just as hard on your cutters as running them too fast, if not harder. Yes! That’s exactly right, there is a Sweet Spot for every cutting operation. It’s not a point that has to be hit exactly, but at the same time, it is not very large either, and there are penalties if you miss it completely. The more difficult the material you’re cutting, the smaller the sweet spot and the greater the penalties. Once you know where the Sweet Spot is, you can tweak your cutting parameters within that envelope to maximize Material Removal Rates, Surface Finish, or Tool Life. In fact, you can often maximize any two of the three, just not all three at once. Let’s take a look at the sweet spots for different things, as well as the danger zones: This chart is relative, meaning you can’t assume anything about the proportions or scale. Just look at the positions of the regions relative to one another, and relative to the idea of faster and slower spindle speeds and feed rates. 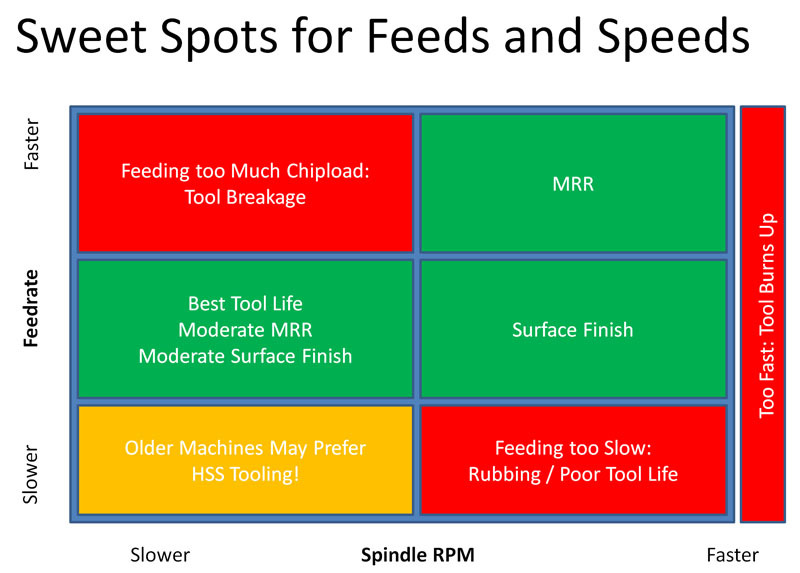 Let’s consider the different labeled zones, left to right, top to bottom: Feeding too Much Chipload As we’ve discussed, when you feed too fast for a given spindle rpm, you’re likely to break the tool. The more you exceed the appropriate speed, the more likely. At some point, you’ll always break the tool. Consider the absurd case where spindle rpm is zero and you rapid the tool into the work. Pop! Just broke another tool. MRR:Running the spindle as fast as we can without burning the tool, and feeding as fast as we can without breaking the tool is the sweet spot for maximum material removal rates. If you’re manufacturing, this is where you make money by getting further up and to the right than the competition. Too Fast: Too much spindle speed will generate excess heat which softens the tool and dulls it faster. There are exceptions and mitigating circumstances we’ll talk about in more advanced installments. Best Tool Life: Slowing down the spindle a bit and feeding at slightly less than appropriate for maximum MRR gives the best tool life. 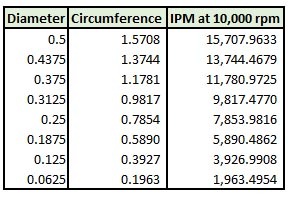 We’ll talk more below about Taylor’s equations for tool life, but suffice it to say that reducing the spindle rpm is more important than reducing the feed rate, but both will help. Surface Finish : Reducing your feed rates while keeping the spindle speed up lightens the chip load and leads to a nicer surface finish. There are limits, the biggest of which is that you’ll eventually lighten the feed rate too much, your tools will start to rub, and tool life will go way down due to the excess heat generated by the rubbing. Older Machines:So your spindle speed has come way down, and in addition, so has your feed rate. You’re probably on an older machine where you can’t run the kind of speeds you need to take advantage of carbide tooling. You may need to switch to HSS. It comes as a surprise to many that there are areas of the feeds and speeds envelope where HSS can outperform carbide, but it’s true, depending on your machine’s capabilities and the material you’re cutting. Check the article “Is Carbide Always Faster than HSS” for more information. Feeding Too Slow: As discussed, feeding too slow leads to rubbing instead of cutting, which can radically shorten your tool life and is to be avoided. Now that you know how the sweet spots break down, you’ll have a better idea how to steer your feeds and speeds to the desired results. Want to experiment with these concepts with no risk to cutters or CNC machine? So, for example, there are 8 suggestions for how to create shorter cycle times. And they’re in the order of highest to lowest impact, so you know what to try first. Talk about making it easy to get seriously in control of your feeds and speeds! You’ll come across the term “Surface Speed” pretty quickly because we use it to determine the right spindle rpm. 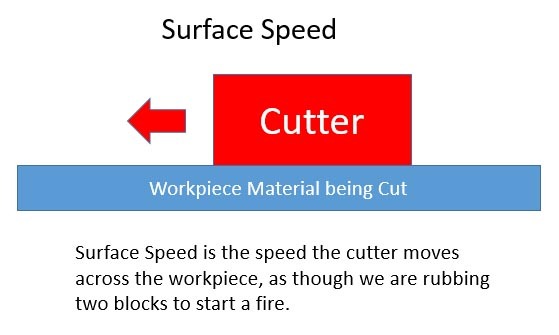 You may also hear Surface Speed referred to as “Cutting Speed”. Surface speed is measured in linear units per minute: feet per minute (SFM) for Imperial, and meters per minute in Metric. You can’t really cheat on Surface Speed. It is what it is and exceeding the manufacturer’s recommendations is sure to reduce tool life fairly drastically except for some very special HSM (High Speed Machining) cases you should only worry about when you’ve mastered the basics. Need a Material Not Listed? We Can Help! If we keep rpms constant, Surface Speed is directly proportional to diameter. The 1/16″ endmill at the bottom is travelling 1/8 as fast in terms of Surface Speed as the 1/2″ endmill at top. Hence, to achieve a given Surface Speed, small tools will have to spin faster and large diameter tools will have to spin slower. There are a number of reasons why this formula is idealized and not the best for real world use, but you get the idea. While cnc feed rates are specified in length units per minute, the more important measurement is something called “Chip load”. Think of a chip as looking something like a comma in cross section, or perhaps an apostrophe. One starts big and gets smaller at the end. The other starts small and gets bigger at the end. We’ll ignore that difference for a moment, though it is important as we shall see later. Chip load is a measurement that is independent of spindle rpm, feed rate, or number of flutes that tells how hard the tool is working. That’s a very useful thing, as you could imagine. Hence, manufacturers and machinists typically like to talk about chip load for a particular tool. You can see that a tool with more flutes (cutting edges) has to be fed faster to maintain a particular chip load. Since each tooth is going to take a cut every rotation, a tooth has only a fraction of a rotation in which to cut a chip that reaches the chip load thickness. During the time it takes to rotate the next tooth to start cutting, the tool has to have moved far enough to shave off a chip that is thick enough. Hence, tools with more flutes can be fed faster. A 4 flute endmill can be feed twice as fast as a 2 flute, all other things being equal. Why do Tools Break from Too Much Chip Load? You can imagine that forces simply become too great if a tool tries to take too much “bite” by having too much workload. This can chip or break the cutter. But there is a second issue that comes from too much chip load–the chips get bigger and eventually can’t get out of the cutter’s way. Beginning machinists probably break more tools because they don’t get the chips out of the way fast enough than because the force of the feed is breaking the tool. If the cutter is down in a deep slot, the chips have a particularly hard time getting out of the way. We use air blasts, mists, and flood coolant to try to clear the chips out of the way, but if they’re way down a hole or slot, it makes it that much harder, and we have to reduce speed. Making matters worse, chips always take more room once they’re chips than the equivalent weight of material takes as a solid. The only place they have to go is gaps between the flutes of the cutter. Of course, the more flutes we have, the less space there is in the gaps. Can you see the point of diminishing returns coming? In fact, some materials have a tendency to throw off such big chips that we prefer 2 or 3 flute cutters instead of 4 flutes. Aluminum is a good example. Many beginners are taught to use a 2 flute in aluminum for chip clearance, but must we always use 2 (or perhaps 3 flutes) for Aluminum and never 4? Now that we know why fewer flutes must be used (chip clearance), we can think effectively about when we might not be restricted to fewer flutes. In general, when you have plenty of room for the chips to escape, you can use a 4 flute cutter, and you’ll get a better surface finish. How much is “plenty” of chip clearance? Forget slots and plunging. Those are the worst cases. Try to avoid tight inside corners or interpolated holes whose diameter is at all close to the tool’s diameter, those are nearly as tough. 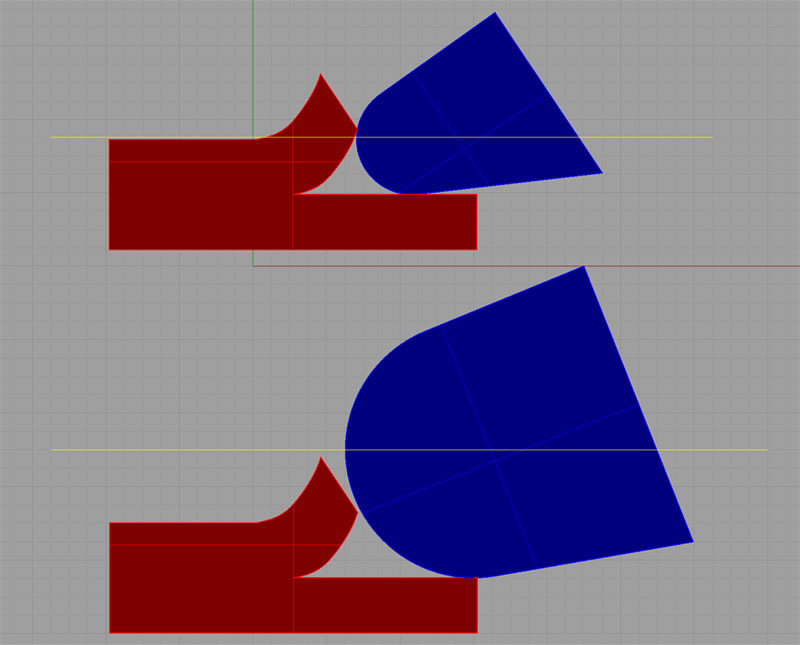 But what if we are profiling around the outside of a part and there’s no concave curves, only convex? Tons of chip clearance there, so have at it. If you have a sufficiently roomy pocket, you may also get away with a 4 flute, especially if you can open up a big hole in the middle of the pocket to get started in. The best case for more flutes is when you have a finishing pass, particularly if you’re already committed to changing tools to get the best possible surface finish from a newer sharper tool that hasn’t been roughing. The finishing pass will be very shallow and the rougher will have opened up plenty of room for chip clearance. 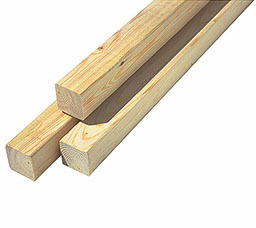 Consider using 2 or 3 flutes for roughing followed by 4 flutes for finishing in materials like aluminum. In harder materials that don’t need so much chip clearance, tools with as many as 10 flutes may be used. This doesn’t just apply to aluminum either.More exotic tools are available with 5, 6, 10 or more flutes. Experienced hands will tell you that if you’re profiling (where there’s lots of chip clearance) steel and aren’t using 5 or 6 flutes, you’re leaving money on the table. Let’s run the numbers in G-Wizard. Suppose we’re profiling some mild steel–1020 or some such. We’re going to profile the outside of a part, so there’s plenty of clearance. Cut depth will be 1/2″, cut width 0.100″, and we’ll use a 1/2″ TiAlN Endmill. Here are the numbers: – 4 Flute: 3158 rpm, 29.8 IPM. MRR is 1.492 cubic inches/minute. A little over 1 HP. – 5 Flute: Same rpms, now 37.3 IPM. MRR = 1.865. 1.3 HP. That’s 30% faster cutting. – 6 Flute: Now 44.8 IPM. MRR = 2.238. 1.6 HP. 60% faster than the 4 flute case. How much more profitable are your jobs if you could run them 60% faster? The cost to do so is a more expensive endmill and a tool change for profiling. Harder materials can benefit particularly well because they’re already up against surface speed limits. More flutes is the only way to get faster feeds. Sometimes we have to go the other way too. If you’ve got some really sticky stainless steel that’s giving you fits in tight chip clearances, try a 3 flute instead of a 4. In the diagram, the cutter edge radius centerline travels along the yellow lines. If the radius is too large relative to the depth of cut (bottom), all the force goes to pushing the chip under the edge. This is the “rubbing” effect you’ll hear talked about when feed rate and hence chip load are too low. Tool manufacturers will tell you that too little feed is just as bad for tool life as too much feed (or too much spindle rpm). But how little is too little? That part is seemingly hard to find out. I went fishing around with Google to try to find what speeds and feeds result in a “burnishing” effect with tools. Here is what I found: – Article on hard milling: 0.0008″ per tooth is definitely burnishing because it is “less than the edge hone typically applied to the insert.” – De-Classified 1961 Batelle Institute report on aerospace machining of super-alloys says an IPR less than 0.0035 will result in burnishing and likely work hardening of these alloys. Interesting how well this number agrees with the one above for a 4 flute cutter. 8 tenths times four would be 32 tenths. – Another reference, like the first, to keeping chip loads higher than tool edge radius. In this case, IPT should be greater than 0.001″. This is once again an article on hard machining where work hardening may be a factor. 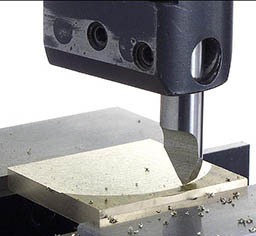 – Minimum chip thickness is 5-20% of the cutting edge radius. Below that level, chips will not form and the cutter will “plow” across the workpiece causing plastic deformation and considerable heat. – Ingersoll says that as a general rule carbide chip loads should not be less than 0.004″ or you run the risk of rubbing which reduces tool life and causes chatter. – Chip Formation and Minimum Chip Thickness in Micromilling uses a figure of 20 micrometers for edge radius on micromills, which is about 0.00079″. They go on to show that the rake angle becomes extremely negative as the chip load falls below the edge radius and conclude that there is a minimum chip load below which the cutter will not cut. It varies from about 0.2 to 0.35 times the radius for various kinds of steel. 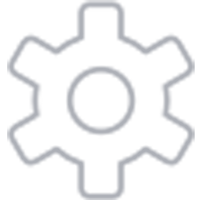 – The Rutgers research paper, “Micromilling Process Planning and Modelling for Mold Making” uses a figure of 1 to 5 micrometers for micromill edge radius, which is 0.000039″ to 0.0002″. If you’ve come this far, you’ve got the basics. And, with a great Feeds and Speeds Calculator like G-Wizard, you can go very far indeed. But, for those of you who want extra credit, who need to dig deeper, or who may want to solve a problem that has been vexing, here’s where we keep the Secret Sauce. These are special super in-depth articles that will make you a Feeds and Speeds Wizard. Toolroom vs Manufacturing Feeds and Speeds: Do you know the difference between toolroom and manufacturing feeds and speeds? Coolant and Chip Clearing: Best practices for coolant and chip clearing on the mill. What Now: My CNC Won’t Go Slow Enough or Fast Enough? 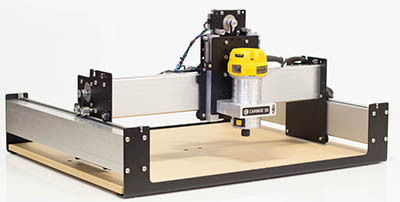 CNC Router and DIY users especially, check this one out. These are workarounds for cases when you can’t get to the right feeds and speeds because your machine can’t feed fast enough or turn the spindle slow enough. It’s a blog post, not part of the tutorial, but it can really help. Is Carbide Always Faster? If your machine’s spindle won’t go as fast as carbide can in softer materials, maybe HSS is the answer. Let’s put together what we’ve learned so far and explore it further. Tips for Getting the Best CNC Milling and Turning Surface Finish: And the truth about mirror finishes. Turning Down the Heat in a Cut: Reducing heat prolongs tool life. Dry Machining: Yes, you can machine without flood coolant. Often, it’s even better. Tool Deflection Control: Critical to Your Success: Are you in control of tool deflection, or is it something that just happens? Cut Depth and Cut Width for Pocketing: How to choose these to maximize tool life and MRR’s. 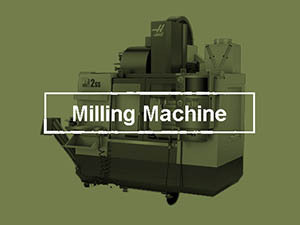 Climb Milling vs Conventional Milling: There are times when Conventional is better! 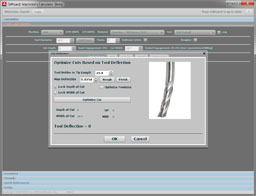 Toolpath Considerations: How is your CAM program treating your tooling? What Now, My CNC Won’t Go Fast Enough or Slow Enough? Sometimes the recommended Feeds and Speeds are not something your machine can even do. This blog post is designed to help you around those problems. How to Choose Stepover for 3D Contouring: Choose the best stepover for speed and surface finish. Deep Hole Drilling: Techniques & Programming. Gun Drilling & BTA Drilling: The ultimate tools for the deepest holes. 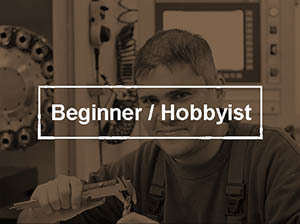 Our Guides for Specific Cutter types includes articles that have tips, techniques, and feeds and speeds information for types including endmills, twist drills, CNC Router cutters, face mills, engraving tools, broaching, and many more. 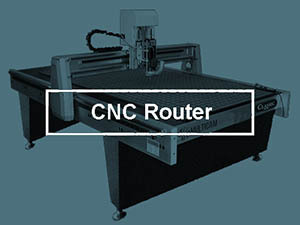 Includes, Upcut, Downcut, Compression, and other CNC Router Cutters. Fly Cutters: More than you ever wanted to know about these ubiquitous cutting tools including DIY Fly Cutters and Tool Grinding. V-Carve, Dovetail, Corner Rounder, Round Over, and Other Exotic Cutters: Finding feeds and speeds for these less often used cutters. Our Guides for Specific Materials includes articles that have tips, techniques, and feeds and speeds information for specific materials. 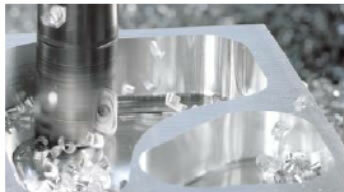 High Speed Machining: Tool Engagement Angle, Trochoidal Milling, Peeling, and all that Jazz. Plunge Roughing: Try this special technique when rigidity or machine performance are making things difficult. Dealing With Chatter When Milling: Fixing Chatter via Rigidity or Tuning Speeds and Feeds. Micro-Machining: How to avoid breaking those tiny little cutters. 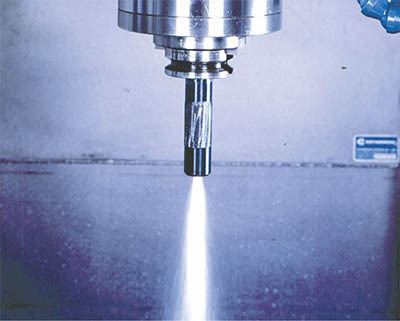 Premium Coolant Options for CNC: Programmable Coolant Nozzles, Through Spindle Coolant, High PressureCoolant, and more. What is Cryogenic Machining? Learn the advantages of using Liquid Nitrogen as a coolant. CNCCookbook Blog Posts Relating to Feeds and Speeds: Lots more in-depth information in bite-sized posts. 10 Tips for CNC Router Aluminum Cutting Success: Take these shortcuts and skip a lot of pain. 7 Software Excuses for Bad Surface Finishes: It isn’t just about Feeds and Speeds. Chip Thinning and Other Ways to Speed Your Cuts: Learn about cases where you should be upping your speeds and feeds and how to exploit them. CNC vs Manual Cutting Speeds: Why is CNC so much harder to figure out? In this chapter, I’ll give you the cutting speed formulas everyone learns in the beginning. But, I’m also going to explain their pitfalls and how you can do much better. Be sure to read the “Pitfalls” section below the formulas! That’s all very easy, right? And, for a fair number of machinists, they think that’s all they need to figure the Feeds and Speeds for their cutters. But like so many things, there are a lot of exceptions where just following the simple math will get us into trouble. Chip thinning can drive down chip load so low that the tool begins to rub instead of cutting. If you want to read more about radial chip thinning and rubbing, try my article on the subject that’s part of our Free Feeds and Speeds Course. I even did a video on chip thinning for Cutting Tool Engineering. Type of cut: Full slot or profile cut. In other words, full width of cutter engaged or something less? Tool Diameter: They want you to be more conservative with tools less than 1/8″ in diameter. A fair amount of additional calculation is being done there, but by the way, it’s still not really enough because the values are not interpolated. One of Niagara’s rules for adjusting speeds and feeds is when the Axial Depth is between 0.25 to 0.5 Tool Diameters, use 80% of the lowest SFM range. But when Axial Depth is equal to or greater than Tool Diameter use 80% of the highest speed range. Now for starters, it sounds to me like they have that backwards. Less Depth of Cut means you can afford to be more aggressive. But, even correcting for that, what are we supposed to do when Axial Depth is say 0.75 Tool Diameters? They don’t say. Here’s the reality: Manufacturer’s Tooling Catalogs are limited by their format in what they can present. Tables are only good for showing 2 dimensions. They add rules like the ones described to try to make things more flexible and fit the cutting physics better. But, the actual cutting physics are quite complex. You need to smoothly adjust your surface speed and chip load for every possible point on the 2 dimensions that make up Cut Depth and Cut Width. There’s no way that can even be shown on paper charts. It has to be a calculation. Many manufacturers realize this and wind up telling the machinist that the catalog values are just a recommendation and that the machinist will need to use their judgement to decide exactly where on the range of values they should be for a particular cut. Can a little hobby CNC cut just as fast as an Industrial CNC Machine? Nope! The Hobby Machine is much less rigid. it vibrates more and it flexes in the cut. The Hobby Machine’s spindle probably has a lot more runout. 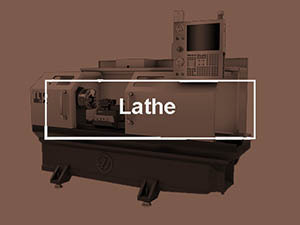 The two machines may have different ranges of maximum and minimum spindle rpms. They may have different maximum feedrates. The spindles on any machine may have different power curves (max power versus rpm) than other spindles. You get the idea. The cutting speed formulas don’t say much of anything about what to do in order to compensate for these differences, or what to do when a limitation is encountered. What do we do if the machine’s minimum rpm is much greater than the rpms recommended by the cutting speed formulas? How can we compensate for lack of rigidity on a lightweight machine? You get the idea. Back solving can be very important where machine limits are encountered. Sometimes we need to work backwards from a limit to see how it affects all the other values in the calculation. But, making formulas work in reverse, especially when we have a large and complex network of intertwined formulas is not easy. It requires very sophisticated math to make it all work out. In fact, even a spreadsheet, as powerful as they are, has a hard time with back solving. If you’re going to be able to handle feeds and speeds problems that require back solving, you’re not going to be able to use simple cutting speed formulas or even a spreadsheet. You will need software that can do it directly. Coolant. Every CNC’er is familiar with it. But did you know it’s two most important purposes aren’t cooling? That’s right. The two most important purposes are chip clearing and lubrication. If we can’t clear the chips well enough from a cut, eventually they’ll pack up in the flutes of our cutter. They’ll jam, and not long after, the cutter will break. Ouch! We all hate when that happens. But all coolant is not equal. For example, coolant needs to be aimed properly. 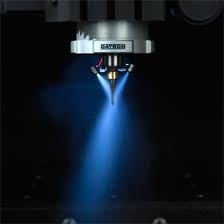 They make technology in the form of Programmable Coolant Nozzles to facilitate proper aim. Even better, there is technology to put the coolant right down at the bottom of the cut where it can do the most good. This is called Through Spindle Coolant because it uses passages to direct the coolant through the spindle, into the tool, and out at the very bottom of the cut. You can do one better than that even by cranking the pressure of the coolant way up. All of this can have a profound effect on the cut if your machine is equipped with such options, but the normal cutting speed formulas say absolutely nothing about the effect of coolant. Recall that Niagara Speeds & Feeds Chart. It calls out soft and hard grades of the materials, and the surface speeds vary quite a lot between the two. But, this is another over simplification due to the shortcomings of trying to present this sort of information on paper. The truth is that there are probably thousands and thousands of different materials to consider. And it isn’t just two ranges. Ideally, every single alloy and condition (heat treatment or other hardening) would have its own speeds and feeds chart. That’s the only way to accurately capture that information. What we’re looking at is a Material Database, not a simple tooling brochure. Having a good one makes a huge difference. High Speed Machining (HSM) is nothing short of magic when it comes to speeding up jobs and even, in many cases, improving tool life at the same time. But, there is no simple cutting speed formula available to give proper feeds and speeds for HSM. Before there were good HSM Feeds and Speeds Calculators like G-Wizard, you had to just look at a bunch of scenarios others published and try to pick one close to your situation. Today, it’s hard to be competitive without using HSM. Even hobbyists have ready access to this valuable technique with Fusion 360. But, don’t use conventional feeds and speeds with HSM. It changes things on so many levels as my article and video on HSM explains. How does the round insert geometry of this button cutter affect feeds and speeds? Remember that chip thinning diagram at the top of the article? As I mentioned, it depicts an endmill looking straight down the spinning axis. But the geometry matters for other cases too. 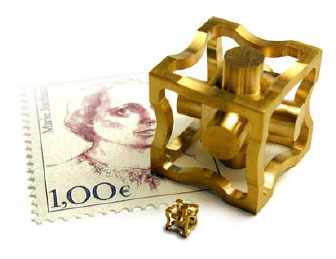 For example, suppose that drawing was depicting a round insert viewed from the side, perhaps for a button cutter. Or a ballnose endmill tip. Yes, you’re starting to see. You can have similar chip thinning effects there. What about the speed of a ballnose that’s cutting less than half the diameter deep? That’s an interesting case, because it means the tool has an effective diameter of potentially a lot smaller tool. Take a 1/2″ ballnose and cut 1/8″ deep and the effective diameter of the ballnose is now 0.433″, not 0.5″. Here’s another one. Suppose you have a Face Mill with a diamond-shaped insert. It presents a 45 degree edge to the cut instead of a 90 degree square shoulder. That 45 degrees is called the lead angle, and it affects your Feeds and Speeds quite a bit. The simple cutting speed formulas all assume square endmills, yet there are so many cutters that aren’t square at all. The calculations have to be adjusted, often in quite complex ways, to account for the differences. People want things their way. It’s just human nature. And when you’re talking Feeds and Speeds, there’s a lot of adjustment. There’s really not just one answer until you consider those adjustments. This is particularly true when we think about roughing versus finishing and the tradeoffs between aggressive material removal rates, surface finish, and tool life. Once again, the simple cutting speed formulas are not helpful. In fact, they’re mute about these things. But, these are things that are well understood and can be factored in. Ask any good expert the answer to a question, especially something like an exact feeds and speeds scenario, and they’ll give you a good answer. But, they’ll very likely give you more than just that answer. For example, they might tell you the numbers and then let you know that there’s a better way. They might remind you of some other considerations, for example, that the cut might be likely to rub, or that those parameters are a risk for tool deflection, or a myriad of other things. Do you ever go through tooling catalogs and read the Technical Information in the back? They’re chock full of great tips and techniques. Except, who can ever remember them all? Well, the expert will. Formulas won’t. But somewhere in between, great software can remember all that and try to offer it up to you at just the right moment. Take a look at the screen shot above where G-Wizard has three tips for us. It wants us to use Climb Milling, it reminds us to use coolant or mist to lubricate when we’re cutting aluminum (otherwise chips can weld to the cutter), and it warns us we’re in danger of rubbing. Try getting any of that from the simple cutting speed formulas. If you haven’t guessed by now, Simple Formulas are not all that great when it comes to Feeds and Speeds. Even spreadsheets, however complex you try to make them, are very limited. And don’t even get me started with CAM software. So many CAM packages now purport to do Feeds and Speeds, but under the covers they’re just running simple cutting speed formulas. You can do a lot better. And, you should. Cutters are not cheap and neither is your time. Being able to get not only better performance but longer life from your cutters is worthwhile. Being able to do so cheaply and in far less time than it’ll take you to punch the numbers up in your spreadsheet is nearly priceless. 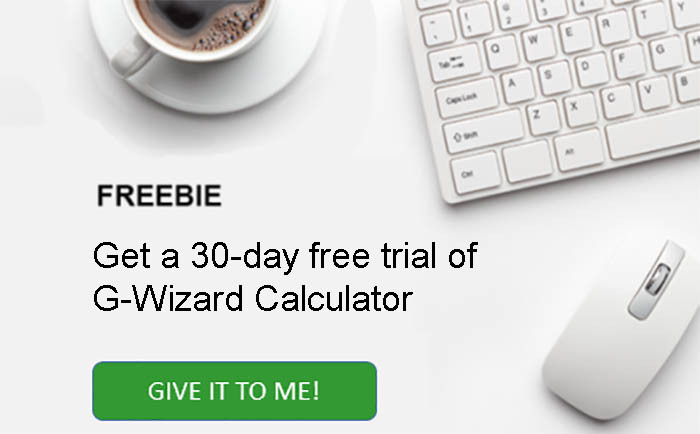 If you haven’t already, take our G-Wizard Feeds and Speeds Calculator for a free 30-day spin. It takes care of every one of the pitfalls we’ve discussed and does a whole lot more. You won’t be disappointed, I promise!